Thames Boat House (Walton Marine) are an Introducer Finance Broker, we are not lenders. 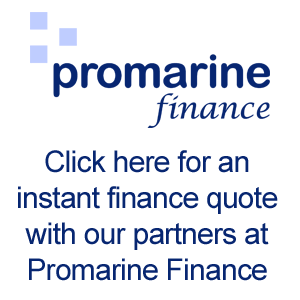 We recommend you take advise from an Independent Financial Adviser before making any commitment to marine finance. Generally there are no penalties for making additional capital repayments which can shorten the repayment period and save you interest. There is no penalty for settlement in full (i.e. if you sell the boat and repay the loan) unless this occurs during the first three months. Marine Loan – Variable rate, fixed term. Marine Loans are secured on the vessel and you would normally pay a 30% deposit. Payments can be spread over 10 years, or up to 15 years in certain circumstances. A Variable rate payment plan enables you to have a loan with interest rates linked to LIBOR and repayed quarterly charged on the day-to-day outstanding balance. Payments therefore will vary during the loan period. Marine Loan – Fixed Rate, fixed term. Marine Loans are secured on the vessel and you would normally pay a 30% deposit. Payments are spread over 5 to 15 years depending on value and your circumstances. Also a baloon final payment or without penalty early repayment enables you to trade on or out as necessary. Lease – Leisure or Commercial Use. Lease terms are available for UK citizens wishing to keep their boats overseas and maybe charter their vessels as a business or to offset running costs. Tax advice and early consultation is essential since terms and scheme management will vary depending upon each owners circumstances. Depending on value and your circumstances the Finance Company may register a charge on the vessel as their security; it will therefore need to be British Registered. The registration costs are your responsibility but we will be pleased to advise on registration procedures, insurance and valuation. Boats must be comprehensively insured by you with an approved company. For used boats the Finance Company may insist that the boat you are buying is surveyed by a qualified professional. The survey costs will be your responsibility. Follow the links below for a quote with up to date rates and terms – prices and rates will vary between providers and figures are a guide only. Finance is provided subject to status and written quotations are available on request. Applicants must be 18+ and UK residents. Security over the vessel may be required. The APR will vary, depending on the amount and period of your loan. Certain craft may be excluded or have limited repayment periods. All figures correct at time of print. Finance information is available in alternative formats, please write for details.